The night is an interesting time. An REM state between a past dusk and the dawn of a new day. The night cloaks and the moon, an obscure distant mirror, renders a surreal palette of hues and colours that lack the direct luminance of the sun. And everything is rendered transient and fateless, until fate arrives. I have a particular fondness, or fetish perhaps, for the other worldness of nocturnes and night photography. So it is with great personal pleasure to finally have a conversation with Greg Girard here on IPA. Greg Girard is a Canadian photographer who has spent much of his career in Asia. He is best known for his Kowloon Walled City images accompanying this interview, and previously featured Phantom Shanghai. 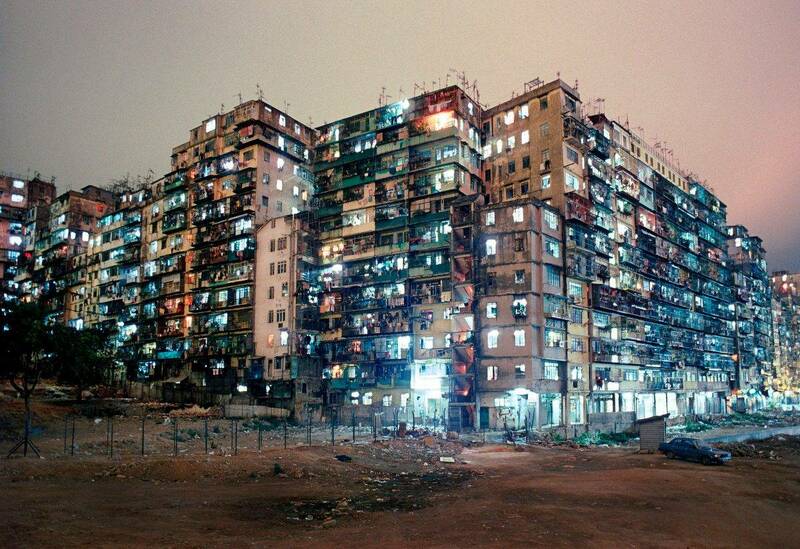 The Kowloon Walled City was a singular Hong Kong phenomenon: 33,000 people living in over 300 interconnected high-rise buildings, built without the contributions of a single architect, ungoverned by Hong Kong’s safety and health regulations, covering one square city block in a densely populated neighborhood near the end of the runway at Kai Tak airport. In collaboration with Ian Lambot, I spent five years photographing and becoming familiar with the Walled City, its residents, and how it was organized. So seemingly compromised and anarchic on its surface, it actually worked -and to a large extent, worked well. The Walled City was torn down in 1992 but the photographs, oral histories, maps and essays in our updated new book, released in 2014, provide the most thorough record of daily life in that extraordinary place. Can you share with us some distinct memories you have of photographing the Walled City? Seeing it for the first time and being completely unprepared for it. I had heard about the Walled City but had never seen it, not even in photographs. One night in 1985 I came around a corner, near Hong Kong’s old Kai Tak airport, where I’d been photographing in the streets below the flight path, and saw this building-thing at the end of the block. It looked completely out of place. A huge high-rise agglomeration, clearly “home-made”, a kind of super-building made up of what looked like hundreds of tall, narrow smaller buildings. Dark shaped and glowing from within. I remember thinking: “how can something like this be allowed?”. I read in your ASX interview that you aren’t all that happy with the way you photographed Walled City. You felt they were too journalistic. Can you tell us more and how you made the transition to a new approach? At the time I was just starting to work for magazines, and was focused on getting pictures published. So stylistically my pictures started to have a certain magaziney look, if I can describe it that way (the worst of which was maybe an over-reliance on wide angle lenses. This was 1987). At the same time the demands of the magazines meant that I’d learned how to use basic lighting equipment, and the Walled City pictures did benefit from that –using lighting to photograph interiors and people, and making it look natural. Can you tell us, how does one crack a “closed community” and gain access and trust? I think you just have to be open about what you’re doing. There’s no possibility of sneaking around anyway, if you’re using a tripod and lighting equipment. So you need to be accepted on some level. Once I decided I was going to do this I started by asking shop or factory owners if I could photograph their premises –these were ground level places and more or less open to the “streets” inside the Walled City. I would make prints for the people I photographed and little by little it got easier. If you had to shoot the Walled City again, what would you do differently? Perhaps make more of an effort to get inside people’s homes, that was always the hardest. I think the book is thorough and representative of what living and working there was like but still, it would have been good to have had more homes to choose from. Having said that, a lot of the workspaces doubled as living spaces so there are plenty of “homes” pictured even if it’s not always obvious. In those you can see the dual nature of the space: kids doing homework in the evening, for example, on what during the day is the family business noodle-making counter. And others like that. What is it about the night, it’s darkness and light, that keeps you coming back? It used to be more of a challenge to make a picture at night. And then there was the delay between making the picture and getting the film results back. Which all contributed to the sense of unknown and adventure of it. Part of the attraction also had to be the not always predictable effects of artificial light on film, especially transparency film. And the way the darker sky sets everything against it, as if a stage-like background. Photographing at night also has the advantage of being less weather dependent. A clear night or an overcast night look very different from each other, but each offers possibility that might be less compelling during the day. Finally, there’s the relative quiet. It’s a more contemplative time. Do you bracket your night exposures? In the dead of night yes, but with long exposures at twilight there isn’t always the luxury of time to bracket. Photographing at twilight, as the sky grows dark, the day/night itself kind of brackets for you. In the sense that a two-minute exposure at 6:17pm is going to look different than a two-minute exposure at 6:19pm. In your interviews, you admitted to not being nostalgic about the places you photograph, or that nostalgia wasn’t a motivation. How would your photographs be affected if you were? Probably they would look like I wanted things not to change, or to go back to the way they were, which isn’t how I feel or photograph. You come across more nostalgic when you speak of Vancouver, wouldn’t you say? As you had childhood memories. I grew up in Vancouver and then lived abroad for thirty years. The city I grew up in and the one I returned to are two very different places. The one I returned to feels a little like a 13-year old who has won a beauty contest. India seems a logical place, with rapid urbanisation across its cityscapes, for you to have photographed too. Were you not interested in South Asia? I had the pleasure and privilege to photograph in India in the late 1980s and early 1990s. And indeed the changes there, urbanization especially, make for compelling photographic inquiry. I expect there’s no shortage of photographers and others making work in that sphere today. I tend to try and unearth things that are maybe a bit more hidden or overlooked. Are you a political person and is there politics in your work? Or are you merely a photographer interested in looking? If photography is a kind of inquiry, and I think it certainly can be, then photographs are political when they question any status quo. I think I’m often trying to balance the feeling that what I’m seeing and how things are, aren’t quite in alignment. It’s a point of view that might not always be obvious in an individual photograph but when seen together as a body of work the idea or point of view (hopefully) becomes evident. MaryAnn Camilleri (Magenta Foundation) described you as a photographer’s photographer – That your archive was huge and filled with great shots. Can you tell us more about your way – how do you start, when do you finish, how obsessively do you photograph? I used to photograph pretty much every day but recently I’ve had my head down with editing and writing for various projects and so I’m a little out of step with my usual habits. I like to be working on a “big” project while at the same time allowing myself to make pictures of “whatever”. The “whatever” pictures don’t have to fit into anything or amount to anything. And following on that, how easy is it for you to work with an editor and surrender your work and its final vision to him/her? I like to think of it as a collaboration but you‘re probably right, it is actually more of a surrender. At some point in the editing I invariably get stuck and welcome someone to take it out my hands. When I was younger I used to think that I was the best editor of my own work. That’s changed. What are your ideas on editing – culling a huge body of work to a small edit sequenced for a book? It’s agony to consider the possibilities. A good book designer and editor are essential in bringing out what I don’t or can’t see. What, in your opinion, is a good book of photographs? One that makes me feel I’ve been waiting for this to arrive, without even knowing it. For me, surprise on some level. Probably the same things that make a good anything or anybody. Mastery of craft, love of the medium, some sense of adventure (physical, intellectual, spiritual). What do you think is the future of photography and its mediums? Really no idea at this point. But given the ubiquity of photo making today, I’m reminded of John Berger’s comment: “If everything that existed were continually being photographed, every photograph would become meaningless”. What do you think is the future of cities and citizens? These days, with the unthinkable occurring on almost a daily basis, nothing is too far fetched. Greg Girard’s books and box sets are available at www.greggirardpictures.com. And more of his work at www.greggirard.com.